eXXpedition, an all-women crew of talented and inspirational women, has set sail on a journey to make the unseen seen: from the toxic chemicals found in the human body to those found in our seas. Aboard the Sea Dragon, a 72-foot sailing vessel run by Pangaea Exploration, 14 women from all walks of life set sail to conduct research into the chemical and plastic pollutants found in the Atlantic Ocean and, through the well-established Body Burden campaign, to explore their own bodies for the presence of toxic chemicals. For its co-founders Lucy Gilliam and Emily Penn, eXXpedition revolves around making positive choices and supporting positive actions through society and governance. Their collective ambition towards this mission statement is borne from two distinctive paths of educational and life experience. Lucy holds a PhD in soil microbiology. Her interest in chemicals and toxics grew not only through her specialism at university, but in the assistance she provided to the heavy metals and toxics team of scientists, performing sampling work in the lab on polar bear and seal blubber. For her, the discovery of the extent to which POPs and industrial pollution impact populations in the Arctic Circle, particularly through human breast milk, started a fascination, and concern, with how toxic chemicals can interfere with endocrine systems, impacting the sexes in different ways. After all, she contends, women are the carriers of the next generation. After her studies, Lucy joined the UK Department for Environment, Food and Rural Affairs, working to build scientific basis in policy making, then moved into the chemicals and toxics team, at which time she met Emily. Lucy and Emily met at a National Geographic event in London and quickly established their joint desire to launch an all women’s sailing expedition to investigate, and spread awareness of the impact of plastics and toxic chemicals on our oceans and the environment at large. Whilst realising that in some cases, the linkage between toxic chemicals and disease outcomes is still difficult to prove definitively, it was at the back of their minds when founding eXXpedition. Added to this was the urgency of the message: if we don’t know, shouldn’t we at least exercise caution? Emily’s journey to meet Lucy at the National Geographic event in London was via a slightly more unconventional path. As a student of sustainable architecture, Emily had the opportunity to visit China during her studies to write her dissertation on eco-cities. Her intention to minimise her carbon footprint in travelling to China via land developed her love of what she terms “slow travel” to experience the transitions in climate, culture and people and not to miss all the bits “in between”. Following her studies, she continued her quest to minimise her carbon footprint and to embrace slow travel by voyaging to Australia, where she had an internship lined up, via boat. As a keen sailor, Emily secured an opportunity on “Earthrace” which was taking off around the world for a promotional campaign on biofuels. Having seen the state of the oceans – through the Atlantic, Caribbean, Panama Canal and Pacific Islands – she discovered the pervasive lengths to which plastics had reached even the most desolate and uninhabited parts of our planet. Coupled with this was the recognition of how climate change and illegal fishing were impacting the most remote pacific islands. Inhabited islands, facing the decimation of fish stocks due to illegal fishing and agriculture due to brackish soil from climate change, were reliant on imports for their food supply, much of which would come in single-use packaging. Most of this packaging would find its way to the beaches of these pristine islands. Uninhabited islands also had their fair share of plastics: she discovered items such as toothbrushes that were clearly thousands of miles from their point of origin. Soon after, with these discoveries Emily, in cooperation with partners, led one of the biggest community-led clean-ups and awareness raising campaigns ever launched in the Pacific Islands. With these collective experiences in tow, Lucy and Emily, together with their crew, embarked on the maiden voyage of eXXpedition in November 2014. During their 3-week journey, the group used surface trawl nets to sample for plastics to quantify microplastic distribution along their route. Pelagic fish were also caught to assess the plastic fragments found in their guts and the presence of toxic residues. At the same time, the group explored their own bodies for the presence of toxic chemicals by assessing their blood and urine samples for the presence of phthalates, heavy metals, PCBs, and other persistent organic pollutants. Lucy and Emily are ambitious in their intentions to spread awareness of the results of this and planned subsequent voyages of eXXpedition. On the 36 one hand is the importance of the scientific results themselves: the scale of the problem of plastics, particularly microplastics, in our oceans and the detrimental impact this has on aquatic life and the fundamental threat to our ecosystems. The other message is more subtle: this is a project intended to celebrate the role of women in science, technology, sailing. Not only does it break down gender stereotypes, but it also harnesses the power of them. Women still make the majority of the purchasing decisions in the home. Lucy and Emily hope that by opening up the dialogue about the harmful effects of single-use plastics and the impact of plastics and toxic chemicals on the environment, human health and well-being in general, that consumers will be motivated to reduce plastic in their lifestyles, to choose products with low toxicity and to inspire change in others. In parallel to informing consumers about their everyday choices is the bigger fish: to support global action on toxic chemicals and to influence governments to take regulatory action. Without a doubt, these are women who have a passion in connecting with people on the issues of plastics and toxic chemicals – to see change and to make change happen. 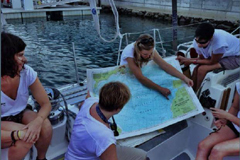 eXXpedition plans further voyages from Cote d’Ivoire to Brazil via Ascension Island in November 2015 and through the Great Lakes in North America in 2016. Funds raised from the voyages and the documentary film recently produced will go to support the development of educational materials for use in schools. Download the documentary film from Vimeo via the following link: https://vimeo.com/ondemand/eXXpedition.